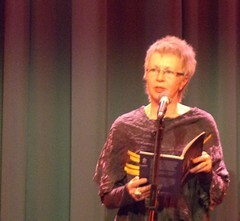 Ashley F Harrold and guest Lesley Saunders reading at Reading’s poetry cafe. In May one of my most-favourite poets, if I am allowed more than one favourite, Brian Patten, will be the guest. That’s as exciting as the delivery of dry chopped wood to a house heated by a wood-burner during a cold-snap when the current supply of wood has run-out. There appears to be an ongoing controversey about the labelling and meaning of the sections. These sections, bits, stages, modes, are referred to as ‘halves’ by the young bearded Mr. Harrold. This controversey is revisited at the begining of each cafe meeting to ensure the audience is not suprised by the unexpected onset of an interval or ‘half’. Many locals take part in open Mic’ sections. That’s not open micky-taking it’s open-microphone in trendy shorthand. I’m beginning to recognise some of the open mic regulars, especially those who’s work I like. This scribble was published on Tuesday, January 19th, 2010. You can follow any banter on this scribble with the RSS 2.0 feed. You can share your inspired musings after typing the anti spam word near the bottom of the page. But no Pinging because its too naughty. Bux we will think of you and Happy frog will lead a cheery toast to absent green friends. 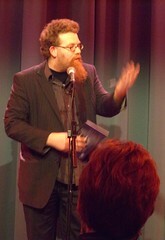 When you next come to the UK we should meet up at the poetry cafe where you can use the open Mic….